Review: Hi ho! hi ho! It is back to Middle Earth we go! Except, in this adventure we have thirteen dwarves, a brave Hobbit and an awesome wizard on a perilous journey to reclaim the Dwarves’ homeland from a dragon. While this film does not quite match the brilliance of the Lord of the Rings trilogy (LOTR), it is still an exciting and enjoyable adventure. Albeit an adventure that does take its time to get going. Through a flashback similar to the one we saw in the Lord of the Rings narrated by Galadriel (Cate Blanchett) we instead get a flashback narrated by Old Bilbo (Ian Holm) who reveals how the evil Smaug (voiced and motion captured by Benedict Cumberbatch) took the Dwarf Kingdom of Erebor. With this all said and done we remain in the Shire for a good 30 minutes or so as the Dwarves come to Bilbo’s house to sing songs and throw crockery around whilst doing so, much to poor Bilbo’s annoyance. Even when the adventure does properly get going it is still slow in parts as more stories are told. However when the adventure does finally get going it is fantastic as we witness some thrilling action scenes reminiscent to some of the great moments we had in the LOTR trilogy. 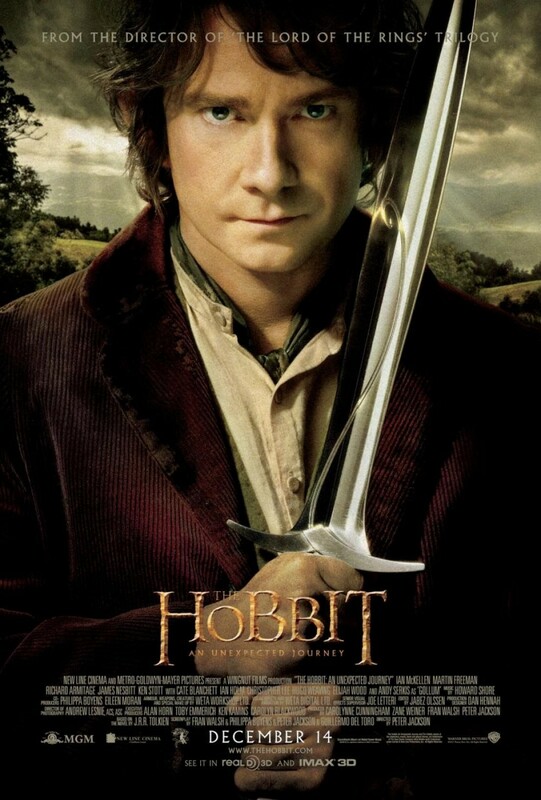 As the titular character Martin Freeman was tremendous in the role of Bilbo. He was likeable and courageous and you find yourself wanting him to earn his place in the company of the Dwarves. On the subject of the dwarves, while a lot of them fade into the background, there are a few that deserve special mentions. One of these is undoubtedly Thorin Oakenshield (Richard Armitage) As the leader of the Dwarf Company you wanted him to be strong, brave and a determined warrior to win back his homeland,and he was all these things. Ken Stott as the elderly Balin is another dwarf who is memorable for his comic relief moments and to be the wise old dwarf that the company need. And of course we have Sir Ian McKellen as Gandalf the Grey once again. He was incredible in the LOTR trilogy and he is equally incredible in this film, save for the fact that he unfortunately does not take on a Balrog of Morgoth in this film. While there is evidently a lot more CGI in this film compared to the Lord of the Rings some of which is a bit bothersome there is still plenty of CGI that does take your breath away. On the subject of great CGI we must talk about Gollum my preciousssss! ( I hope you read that in Gollum’s voice) Although he is not in the film long, he is just as brilliant as he was in the LOTR trilogy. The Riddles in the Dark scene with him and Bilbo simply is first class entertainment and a definite hight point of the film, along with the last act of the film which is also incredible. Howard Shore’s score is also first class. Shore scooped two Oscars for his great work in the Lord of the Rings and he’s again on fine form here as the score is of the highest quality. All in all this film was thoroughly enjoyable and a great watch. While it does take its time to get going, when it does get going it is thrilling with some terrific scenes that remind you what you love about the world of J.R.R Tolkien and Peter Jackson to a certain extent. While the decision to make it into a trilogy as opposed to two films, has been criticised by some people. While the CGI is in places bothersome in parts, it was still a welcome return to Middle Earth and I look forward to the next instalment of this adventure. The pacing is a little slow, as the film takes it times to get going but to be back in Middle Earth is a joy to behold, and once it’s full steam ahead, there’s much to enjoy.